Swimming Pool Safety Cover Wood Deck Anchors. Complete brass (wood deck) anchors for swimming pool safety covers. 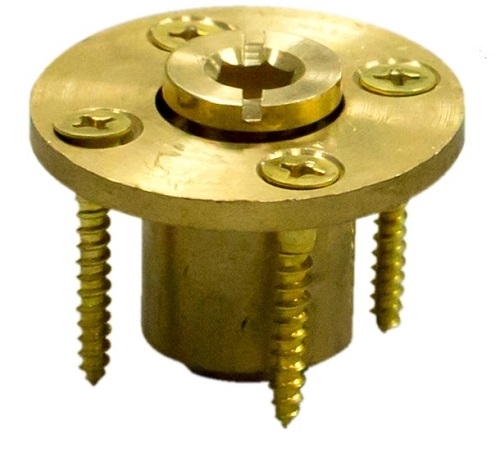 Wood Deck Anchors come complete with brass screws and brass anchor flange. These anchors can be used to replace old anchors or in new installation. Sold in sets of 5 only! Note: In some cases, the use of Wood Deck Anchors around more than 10 percent of the pool perimeter will void your safety cover warranty. If you are using more than 10 percent Wood Deck Anchors for installation, then please contact the manufacturer of your safety cover to find out if this will affect your warranty.